14 Commercial Real Estate & Properties in Biggera Waters are listed in 3 categories. We have 9 Industrial Warehouses Sale & Lease , 3 Retail ShopsSale & Lease and 2 OfficesSale & Lease . 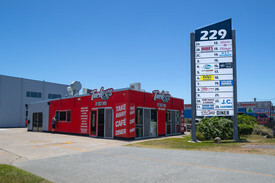 Industrial Factory 218m2 Security Grate High access industrial roller door large onsite car park Down the road from Harbor Town Shopping centre close proximity to M1 motorway West fields shopping centre Approx Disclaimer: Ray White has not independently checked any of the information we merely pass on. We make no comment on and give no warranty as to the accuracy of the information contained in this document which does not constitute all or any part of any offer or contract by the recipient. Prospective purchasers / lessees must rely on their own enquiries and should satisfy themselves as to the truth or accuracy of all information given by their own inspections, searches, inquiries, advices or as is otherwise necessary. No duty of care is assumed by Orchid Avenue Realty trading as Ray White Surfers Paradise Commercial divisions toward the recipient with regard to the use of this information and all information given is given without responsibility. 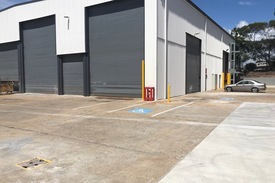 492m2 factory which can be leased as on unit or separated into a smaller workshop Small air conditioned office/reception area 3 x high access industrial roller doors Plenty of natural lighting and height to allow for pallet racking Own amenities including toilet kitchenette Plenty of onsite car parking onsite Approx Disclaimer: Ray White has not independently checked any of the information we merely pass on. We make no comment on and give no warranty as to the accuracy of the information contained in this document which does not constitute all or any part of any offer or contract by the recipient. Prospective purchasers / lessees must rely on their own enquiries and should satisfy themselves as to the truth or accuracy of all information given by their own inspections, searches, inquiries, advices or as is otherwise necessary. No duty of care is assumed by Orchid Avenue Realty trading as Ray White Surfers Paradise Commercial divisions toward the recipient with regard to the use of this information and all information given is given without responsibility. "a" Grade Renovation Location $93,470 + GST Gross PA (I..
Shop 3 100m2 Showroom / retail/ office space Shop 4 144m2 Showroom / retail/ office space Both units can be combined into 244m2 space or lease separately Great signage exposure to Main Road Food use is also accepted Ample car parking for staff and guests This is a great opportunity, owner extremely motivated Approx Disclaimer: Ray White has not independently checked any of the information we merely pass on. We make no comment on and give no warranty as to the accuracy of the information contained in this document which does not constitute all or any part of any offer or contract by the recipient. Prospective purchasers / lessees must rely on their own enquiries and should satisfy themselves as to the truth or accuracy of all information given by their own inspections, searches, inquiries, advices or as is otherwise necessary. No duty of care is assumed by Orchid Avenue Realty trading as Ray White Surfers Paradise Commercial divisions toward the recipient with regard to the use of this information and all information given is given without responsibility. 172m2 office area over two levels 86m2 2nd floor semi furnished Incl. large kitchen and amenities 86m2 3rd floor open plan area Fully air conditioned throughout Incentives for long term tenants Will submit every offer approx Please contact the listing agent for more details by clicking on the link above. Disclaimer: Ray White has not independently checked any of the information we merely pass on. We make no comment on and give no warranty as to the accuracy of the information contained in this document which does not constitute all or any part of any offer or contract by the recipient. Prospective purchasers / lessees must rely on their own enquiries and should satisfy themselves as to the truth or accuracy of all information given by their own inspections, searches, inquiries, advices or as is otherwise necessary. No duty of care is assumed by Orchid Avenue Realty trading as Ray White Surfers Paradise Commercial divisions toward the recipient with regard to the use of this information and all information given is given without responsibility.